The Sinn EZM range are the most function-focused of their watches, and their latest model, the EZM 12, was developed for medical professionals involved in emergency air rescues. Time is critical in rescue/ emergency medical situations in terms of treatment, and the EZM 12 focuses on two concepts – the ‘golden hour’ and ‘platinum ten minutes’. This means that a patient should arrive at a hospital within the hour of an accident and that a critical patient should be treated and transported within the first ten minutes. A count-up inner rotating bezel allows the doctor/ paramedic to keep an eye on the ‘platinum ten minutes’ and ‘golden hour’, whilst a countdown outer rotating bezel can be used to serve a number of purposes such as the monitoring of times for the administration of medication. The seconds hand, designed in the shape of a rotor, features a pulsometric scale for recording of the heart rate every 15 seconds. Another notable feature of the EZM 12 is are the focus on creating a watch that is easy to clean. The silicone strap can also be removed without the use of tools and you can remove the rotating bezel, to clean, using the pocket knife provided (or anything else that can fit) in the dedicated space, and simply flip it off. This looks like a hefty watch and that’s because it is; 44mm and 122g (without the strap) of Sinn’s bead-blasted Tegimented steel, and water resistant to 200m. Behind the screw-back nickel-free case back is the automatic ETA 2836-2. The EZM 12 also features Sinn’s air-dehumidifying technology, magnetic field protection up to 80’000 A/m thanks to a soft iron cage, and has been tested to be reliable from -45°C to +80°C. And if you have no plans to rescue lives in the next few days, it does not really matter. 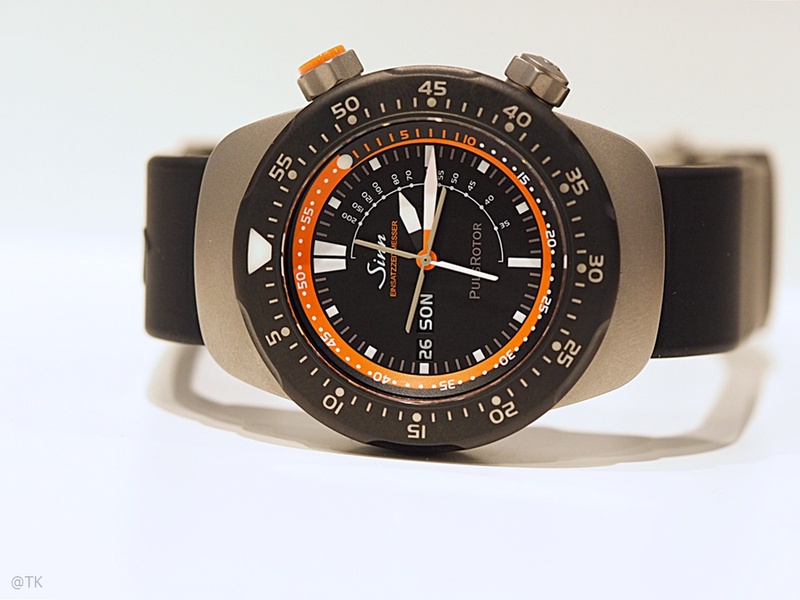 The Sinn EZM 12 is a cool tool watch that is also good looking enough to be a daily wearer too. For Australia the RRP is $5,350.